Efficient insulation in floors and stud walls. Produced using natural sheep’s wool. Easy to handle and fit. Acoustic Mineral Wool or our more efficient Soundblocker Quilt also produced using sheep’s wool. Dust mask, overalls, gloves & goggles. 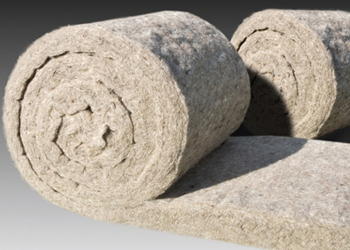 THERMAFLEECE EcoRoll is produced using a large proportion of naturally produced and recycled products supplied in a low density easy to handle roll. It is available in 75mm, 100mm and 140mm thicknesses in a compressed form for ease of transport. Once unrolled, it quickly regains its correct thickness to give optimium insulation performance. Similar to all wool based products, Ecoroll is safe to handle and kind to the skin and once installed will help regulate moisture and absorb some harmful gases within the environment. Using Thermafleece Ecoroll to insulate the home will reduce a large amount of heat that is otherwise lost from an uninsulated building and so will save money by reducing the consumption of that leaked energy. Once installed the product is durable, stable and long lasting so it can be fitted and forgotten. Each roll is produced and supplied to ISO 9001 and ISO 14001 quality and environmental standards. Ecoroll sheep’s wool will also help reduce many tonnes of CO2 emissions over its lifetime by its continued use. No special protective clothing is required during its handling and surplus can be recycled or disposed of in accordance with local authority requirements. Although protective clothing is not necessary when handling this product which is harmless, a dust mask is advised if working in confined spaces such as lofts.